Costa Rica is one of the world's most adventurous family-friendly places, widely known for its dedication to peace, cultural exchange and environmental education. Our Costa Rica Family Adventure visits areas that exemplify these qualities creating wonderful shared memories for years to come. All aspects of this tour, from more spacious accommodations to less rigorous transfers to the planned activities, have been designed with the traveling family in mind. Upon arrival at San Jose's Juan Santamaria International Airport you are met by a representative and transferred to your hotel in San Jose. Start your tour with a scenic drive to Arenal Volcano, stopping en route at La Paz Waterfall Gardens for lunch and an up-close view at a system of 5 different waterfalls. The gardens also include child-friendly butterfly, hummingbird and frog gardens. After lunch continue on through the scenic highlands to Arenal. From the lodge, which is situated safely on a high ridge only 1.6 miles south of the volcano, take in an impressive view of this "giant which rumbles." The lodge is the only property located within the Arenal Volcano National Park, which encompasses thousands of acres of pristine rainforest and teems with tropical birds and wildlife. Enjoy a morning hike to a nearby waterfall and an up-close exploration of a lava flow prior to the drive Monteverde. Skirting the shores of Arenal Lake, make your way to Monteverde, one of the most diverse and richest tropical cloud forests in the New World. Monteverde is best known as home to the Resplendent Quetzal but includes hundreds of other birds, mammals and plant species. Arrive in time to explore the nearby town of Santa Elena. Morning guided hike through the Monteverde Cloud Forest Reserve viewing the wet forest with its dense vegetation and majestic trees. The perpetually misty forests of the Reserve encompass eight distinct ecological zones and protect more than 100 species of mammals, 400 species of birds and 1,500 species of plants. In the afternoon visit the SkyTrek, a system of suspended cable zip lines constructed within the cloud forest, that give the participant a unique thrill and vantage point high in the forest canopy. For those not interested in zip lining, the Sky Walk, a hiking system of suspended bridges, may be substituted at no additional cost. Our representative will transfer you in an air-conditioned vehicle on a scenic drive through the dry savanna of Guanacaste to the North Pacific Coast, and on to your luxury beachfront accommodation just outside of Tamarindo. The remainder of the day is yours to stroll the beach or relax by your hotel's pool. Spend your days in Tamarindo simply soaking in the Pacific views, or opting for several activities available to your family at additional cost, such as snorkeling, horseback riding, surfing lessons, kayaking and more! Return by plane to San Jose where a representative will take you to your hotel in Costa Rica's capitol. Spend your last afternoon in Costa Rica taking in a museum or exploring one of San Jose's several colorful markets. Transfer to the international airport for your return flights home or begin your trip extension. Child rates apply to children 11 and under who are sharing rooms with two adults. Rate applies through November 30, 2016. This lodge-based trip is a perfect extension for any of our Costa Rica small ship cruises or for those with limited time. Experience exhilarating Costa Rica zip line tour at Arenal Hanging Bridges, soak in hot springs and see the Arenal Volcano and hike through the lush Monteverde Cloud Forest. Explore famous national parks, tropical gardens and wildlife reserves of Costa Rica and Panama aboard the 62-guest National Geographic Sea Lion. Transit the legendary Panama Canal and visit Barro Colorado with Smithsonian scientists and expert National Geographic guides. Hike, kayak, swim and snorkel. Set high on a ridge facing Costa Rica’s most active and spectacular volcano, the Arenal Observatory Lodge offers adventure travelers a unique, once-in-a-lifetime experience. The Arenal Observatory Lodge has 48 spacious rooms, most with a direst view of the volcano and/or the forest. Five rooms are fully equipped for disabled travelers, with rooms, bathrooms, hallways, parking areas and even the new swimming pool designed accordingly. This lodge is also recognized as one of the highest rated eco-lodges in Costa Rica. The lodge is located just 17 miles from the active crater of Arenal Volcano, and is separated from it by a deep river valley. Scientists from the Smithsonian Institute specifically chose the location for its close but safe vantage point from which to study the volcano. Arenal Observatory Lodge sits on 870 acres of land adjacent to the Arenal Volcano National Park. The site contains 270 acres of primary rainforest with well-marked trails, 400 acres of reforestation projects and 200 acres of working farm lands. There are 7 miles of well-maintained trails for walking, horseback riding, biking, running and observing a variety of flora and fauna. Approximately 400 species of birds live in the area making the Arenal Observatory Lodge a preferred destination for bird watchers. Activities at the hotel include hikes to the waterfall or to explore Cerro Chato (an extinct volcano with a small lake in the crater), horseback riding, bicycling through the trails, enjoying a refreshing swim in the pool or simply relaxing with a massage in the spa. 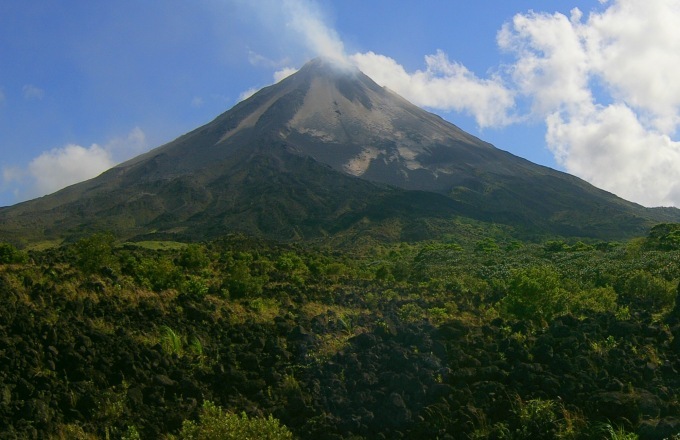 Please take note that other adventure activities, local tours and trip excursions are located about 45 minutes away from the Arenal Observatory Lodge. Hotel Capitán Suizo rests on Playa Tamarindo, one of the most beautiful Pacific coast beaches in all of Costa Rica. Directly on the beach, the hotel is surrounded by large, native trees and lush, colorful gardens. Imagine yourself in a charming hotel among vivid gardens with the Pacific Ocean spilling onto the beach in front of you. As you lounge by the swimming pool, birds and iguanas keep you company, and a curious monkey wanders by. The only sounds are the chatter and songs of nature's creatures and the whispering of waves. This fantasy is yours to treasure at Hotel Capitán Suizo. Eight thatched-roof bungalows and 22 rooms dot the grounds, each spacious and comfortable, with a patio or balcony. All are decorated with natural stone and hardwoods. Bungalows and second floor rooms have fans and catch refreshing sea breezes, so no air conditioning is needed. Rooms on the first floor have air conditioning. Steps away are the beach, a huge free-form pool and open-air restaurant and bar. Capitan Suizo is a perfect complement to a nature vacation or honeymoon in Costa Rica. Hotel Bougainvillea allows you to step back from the hustle and bustle of Costa Rica’s capital city to a quiet place between the mountains where country roads and villages, fresh breezes and never-ending spring seasons invigorate and renew. Located just 10 minutes from San Jose, this family owned and operated inn is set on a hillside with wonderful views across the valley. Twelve acres of lush gardens feature over 50 species of bromeliads, Costa Rican native trees, numerous species of orchids, herb and cacti gardens, and radiant humming birds. Rooms are large with two double beds, a sitting area with specially made Costa Rican hardwood furniture, cable TV and direct dial telephones. Each has a balcony offering marvellous views of the mountains on one side and the San José skyline on the other. Hotel Bougainvillea has the charm of a family owned and operated hotel. Every detail of the hotel and restaurant is personally supervised by owner Hans van der Wielen. Guests can stroll in the gardens, swim in the heated pool, enjoy a sauna or use the tennis courts. Additional amenities include a gift shop, meeting & conference facilities, Internet access and currency exchange. Hotel Heliconia in Costa Rica's famed Monteverde region is located on a 6-acre property surrounded by lush tropical rainforest. Family run by Doña Roxana and her family, Heliconia is one of the pioneer hotels in the Monteverde Cloud Forest area. The perfect setting for those who love birdwatching and the serenity of a mountain retreat, the lodge offers panoramic views of Monteverde and opportunities to see hundreds of exotic birds and animals. The ambiance at Hotel Heliconia offers home-style comfort, with fine wood finishing throughout. Standard rooms on our itineraries are Junior Suites, with two king-size beds, coffee maker, telephone, spacious private bathroom, flat-screen TV with cable, safety deposit box and a beautiful private balcony with sitting area and amazing views of the Monteverde mountains and the Nicoya Gulf. Upgrades to master suites and family suites may be available. Two restaurants as well as a bar are onsite. Walking trails, scenic gardens and numerous jacuzzis dot the property. Amenities and services include free breakfast, complimentary Wi-Fi in hte lobby, concierge services and luggage storage. This itinerary is designed for families, but is appropriate for any individuals looking for an adventure highlighting some of the best attractions that Costa Rica has to offer. Protect your travel investment with insurance. Our partners at Travelex Insurance offer a variety of plans and policies to fit every trip and budget. You must purchase your travel insurance policy within 21 days of booking your trip for it to cover pre-existing medical conditions.